Don't know what kind of horror story your friend had. 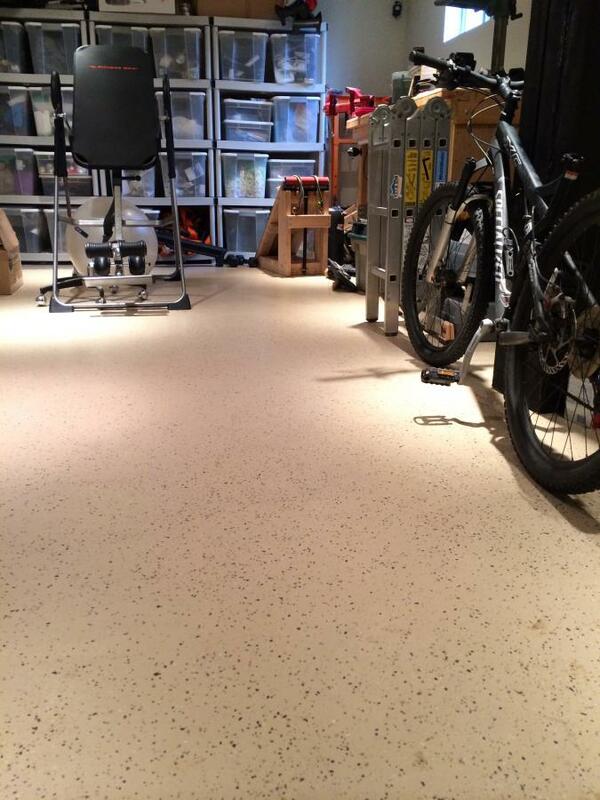 I epoxied the floor in my last 3 garages with great effect, will do it again if the need arises. Perhaps he used low quality product or didn't prep the surface properly. The latter is quite important, and some folks short cut it. Same here. It does melt a bit from welding, torch cutting, etc but overall it has held up well and the price wasn't bad. I had a few pieces of that race deck I had got as samples and I used them as a ground bad when having to kneel down. One of them pretty much melted after getting a bit of brake cleaner on it. Another nearly burned the place down after getting some sparks on it. You'd think that a product that goes in a garage would be at least somewhat chemical and fireproof! A 1970s shag carpet would have been safer! Professionally done epoxy. Sure the DIY is OK, we've done storage rooms with it. But a pro job is 10X better. Many choices of finishes and color. You can drag an anvil over it with no mark. Brake fluids won't mar it. Everyone who has seen it loves the look. Notice how we put it on some thin concrete blocks as "baseboards" too. I had gotten quotes to get mine done professional and it was going to be $5000-6000 . I spent about $400 on the kits at Lowe's. I'm sure we all have our different ideas of what is expensive, but I surely wasn't spending that kind of money on a garage floor. It's held up fine against dragging stuff, chemicals, cars, smaller heavy equipment. Only thing that has torn it up a bit is when hot metal has fallen on it from plasma and torch cutting or welding. The pro floor at work didn't hold up to that at all either. Did paint it ourselves. And it's really a shade of green not blue as these pictures suggest. Hot metal is quite a challenge. I hope not to have that one in our garage! Can't get past the 2 beautiful cars to even look at the garage floor. Awesome Garage! Thanks, we are very blessed. 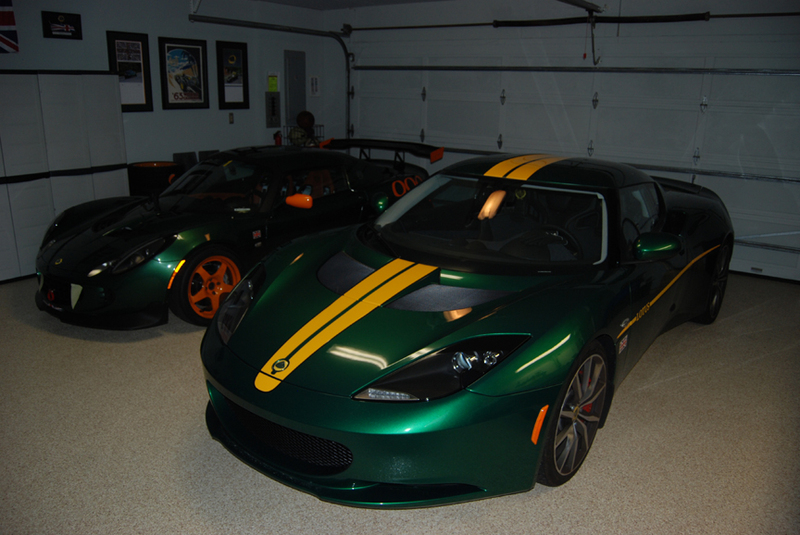 Placed a deposit on the Evora while she was still on other side of the pond, that motivated a garage redo. Both cars (and the Europa) will be at Log 34, about three miles from our garage! IIRC racedeck quoted me like $3000 for my garage and if I'm gonna spend that much I'd rather go epoxy or tile. Have yet to get a quote on either of those, but I imagine it would probably up near that price if not more. Has anyone done tile? I was wondering how it would hold up to jacking up a car, to jack stands, etc. One thing is for sure with tile, the grout will fail. Maybe if you put it in very dark it won't look so bad with time but it will crack and come out in some spots for sure. If your base slab settles and cracks, so will the tile. We just spent over $6,000 on tile for a smallish bathroom. Not an inexpensive proposition. Now in a large very high end garage tile would probably be the most chic. And paver stone drive. Maybe an elevator, and a turntable too. Last edited by XHILR8N! ; 12-27-2013 at 05:56 PM. Tell them you want the garagejournal.com discount. From what I can gather its about 20-30% off. Haven't done it myself yet as I'm in the same boat as you checking out the different options. 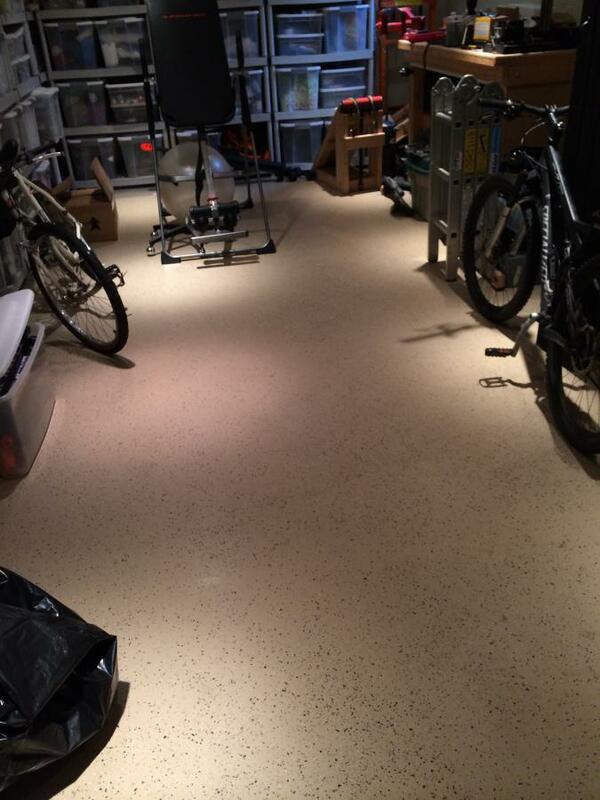 I did my basement with that Hoe Depot stuff and got fantastic results! My wife was bitching and complaining how long it has been taking to prep the floors as per instructions but I didn't allow us to take any shortcuts. The prepping took about 3 or 4 X it took to paint and sprinkle to finish...I think I put on twice the sprinkles that they supply. I'm going on 8 years and still as good as the first day. I may get another quote here in the near future just to see what it is again. 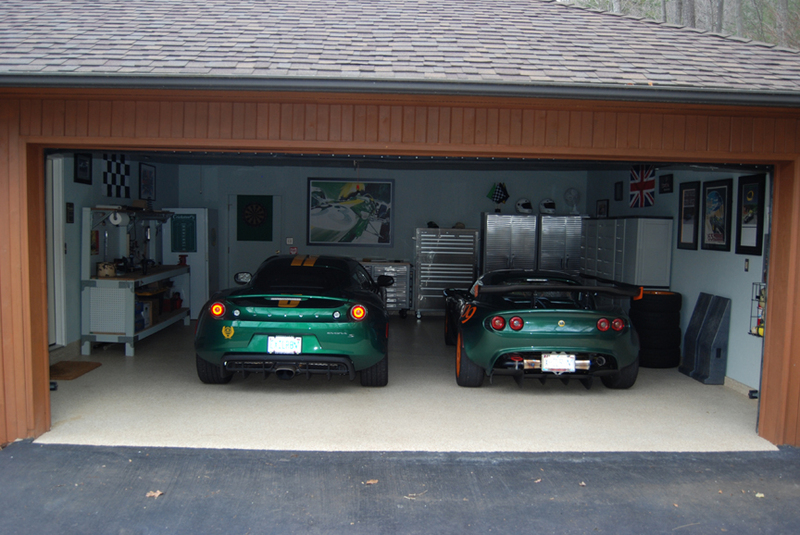 I was able to complete 1/2 of the garage (at the time of the pics) keeping the Lotus safe of the other side. The lower level is now complete... I need to finish the upper level. From garage to Lotus showroom!!!! Ceramic tile is relatively inexpensive and looks awesome but is very slippery when wet and prone to damage from dropped metal objects (like tools.) When damaged it is difficult to repair ( my father was a professional ceramic tile installer.) I did a professional multistep epoxy seven years ago and it has held up beautifully. The Home Depot stuff will not hold up to garage type use although it is fine for basements and places that will not see solvents and a lot of temperature change. It doesn't bond to any more than the most superficial part of the concrete. Professional systems start with a water soluble epoxy that soaks in to the top 1/8th inch of the concrete and forms a much more permanent substrate. Epoxies need to be coated with a polyurethane finish if light colored or they can be stained by Dexcool and PVC cement. 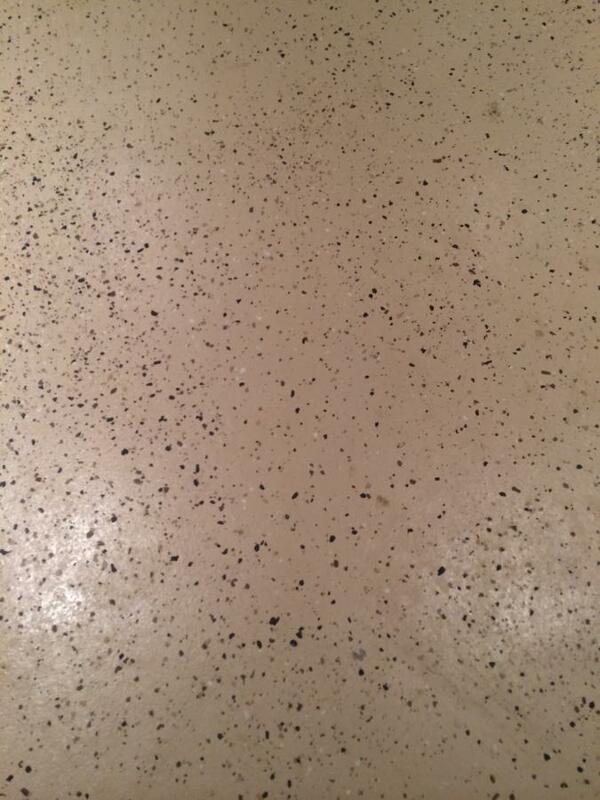 Also had garage floors done professionally with epoxy. It's been extremely durable and definitely gives the garage a clean look. Price was around 2500 for 3 bay garage. Looks awesome. But I'd be afraid to break the tiles as much work as I do in the garage. $2500 is cheaper than racedeck. Yours looks good. I figured for 3 car it would cost a bit more than that. I shall have to get some local quotes. What a garage, I love the DBS and the color. One day I would like to have an Aston of my own.